The Imperial War Museum (IWM) have airshows at Duxford at least three times each year. The May show is generally themed and has been the 'Air Festival' since 2017. 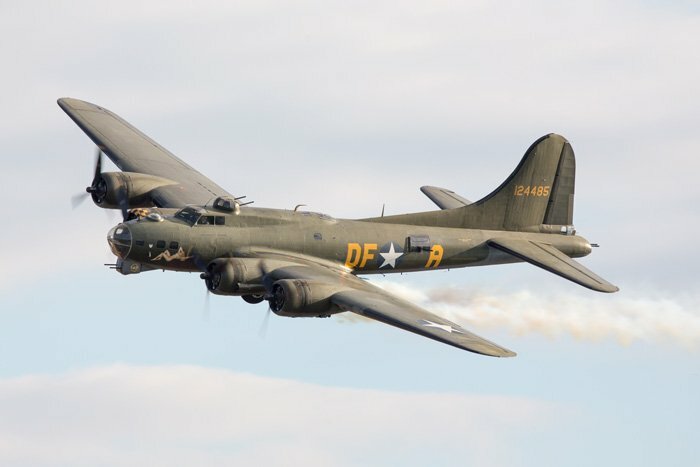 Flying Legends is in the middle of July and the main Duxford Air Show is in early autumn. This is also themed: since 2017 it has been the 'Battle of Britain Air Show'. As well as aircraft based at Duxford, shows also include visiting aircraft, most of which are chosen to suit the theme. You can select a specific airshow from the top menu or the table below for more details of this year's shows. Duxford was an airfield in the First World War and was an RAF fighter station and then an American fighter base in the second. It was the base of the first operational Spitfire squadron during WW2. It is now home to the Imperial War Museum with aviation, tanks, military vehicles and naval exhibits as well as the Fighter Collection, The Old Flying Machine Company, The Aircraft Restoration Company, Historic Aircraft Collection, B-17 Preservation Society and others. Duxford is in Cambridgeshire, off Junction 10 of the M11. If you are coming from the north, a signposted alternative is to leave at Junction 11 and take the A10 to Royston, then the A505. This is a much longer route designed to split the traffic up. There is parking at the museum. The Post Code (for Sat Nav) is CB22 4QR but some systems will only recognise the older code CB2 4QR. There is a park and ride at Junction 11 of the M11 on show days. The bus is free (you have to show your show ticket) but parking isn't. National Express have coach services to Cambridge, from where you can catch the show's shuttle service. The easiest train station is Cambridge, which has a direct service from London. A half-hourly courtesy bus runs between the show ground and Cambridge station on show days. Otherwise take a Stagecoach service C7 or Myalls service 132. Click this blue Expedia name for a list of hotels and guest houses near the show. The venue is already built into the link, so when the list comes up you just have to enter your dates and, if necessary, change the number of guests or rooms. The International Hotels Group have a Holiday Inn Express near the airshow but it sells out very quickly for airshow dates. There is another Holiday Inn Express and a Holiday Inn in Cambridge about 9 miles away and a Holiday Inn Express in Stanstead about 20 miles to the south. There are three Premier Inn hotels in Cambridge and another two within 20 miles of the show. Travelodge have an hotel about 4 miles from the show, which tends to be available a little bit longer after other low-cost hotels have been fully booked. There are three more Travelodge hotels in and around Cambridge.